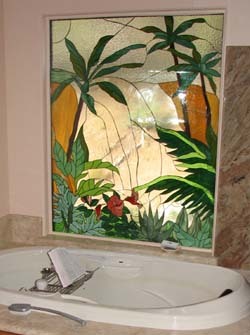 A client commissioned our studio to create a tropical scene, including a waterfall and lots of foliage, to grace their newly remodeled bathroom. We went back and forth with the client multiple times refining the pattern until he felt it was perfect. Normally we would have used opaque glass for privacy, but this client insisted that we use clear water glass because of the realistic feel it brings. As he had no neighbors nearby, it made sense to build it this way; however, for the Design of the Month I substituted the clears in the water with opaque blues. 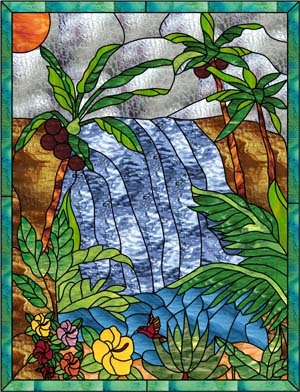 There are also some other slight variations that were more to my preference, such as coconuts in the trees, a colored border, and a few more colored flowers in the lower left corner The bright colors in the flowers contrast with the greens and make the overall appearance warmer and more dramatic. Once the pattern was completed and approved by the client, we printed it on our plotter and off to the studio it went for production. When we were done we insulated the window in between two pieces of clear tempered glass and installed it in our client's bathroom. Our client was incredibly happy with the result and is going to order another window from us as part of his upcoming kitchen remodel. Glass Eye 2000 always helps us to come up with accurate designs that appeal to our clients. In fact, the gentleman we made this window for did stained glass for a number of years when he was younger, and he was simply amazed how the stained glass design process has progressed and merged with the computer age. For an art form that has been designed and made the same way for thousands of years, we are lucky to live in a time where a tool like Glass Eye 2000 is possible. Thanks to everyone at Dragonfly Software for creating such a great program that allows us to give our clients exactly what they envision every time. Derek Schmid and his wife Raeanon are co-owners of StainedGlassWindows.com. Derek has been in the glass business for nearly nine years and enjoys watching his company grow. Most of his time is spent marketing as well as corresponding with customers via the Internet. 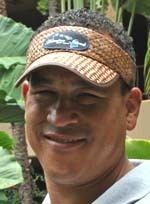 He lives in Imperial beach, California and enjoys spending time with his wife and their two kids Kalea and Kanoa. You can reach Derek via email.